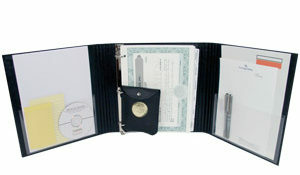 A binder with gold detailing of entity name which includes 20 custom printed, numbered Stock Certificates, customized folding Corporate Seal with carry pouch, Stock Ledger, Special Forms Section which includes IRS requirements for Sub-Chapter S filing and Section 1244 forms, and specialized index dividers. Note: Item is shipped with 1 set of 20 stock certificates – starting number of stock certificates as specified by customer. Additional stock certificates may be ordered as separate product listed under “additional products and services”.